The Wizarding World of Harry Potter has finally returned to LEGO and, like most fans of the franchise, I couldn’t be happier. 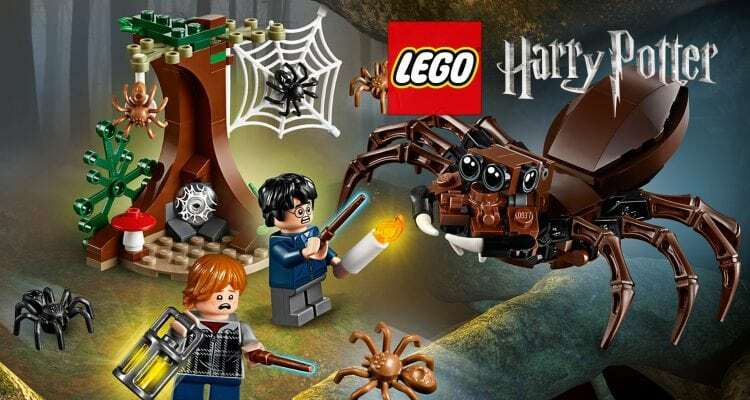 In addition to numerous sets taking inspiration from key scenes from the movies, the Fantastic Beasts franchise has joined the team for the first time outside of LEGO Dimensions. It truly is a great time to be a Harry Potter fan. 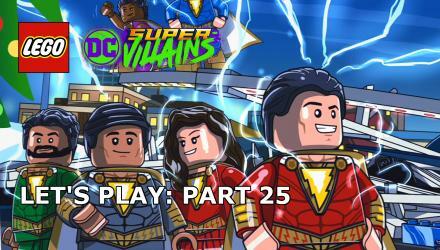 Old or young, rich or poor, this latest collection of LEGO sets has something for everyone. Starting at the pocket money priced Aragog’s Lair set that I’m about to review, the range goes right up to an epic £300+ Hogwart’s Castle that is simply stunning. As much as I would love to be sitting here reviewing that Castle, we’re going to start with something a little more budget-friendly and for under £13, you really can’t go wrong. As always, let’s start with the biggest draw of any LEGO set, the minifigure collection and let’s not mince words here, for £12.99 you’re getting your money’s worth. 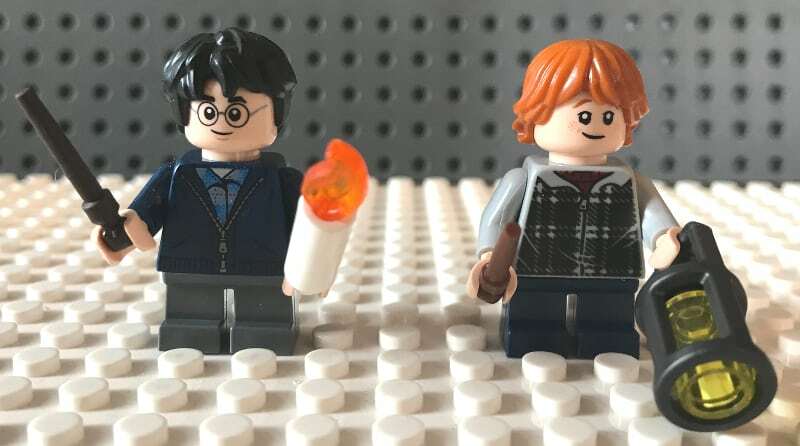 Both Harry and Ron come in this set in Chamber of Secrets variants that will have Potter fans and LEGO collectors more than willing to buy the set – let’s face it, these two would probably make more than £12.99 on eBay on their own. Both minifigures come with the new enhanced wand design that you may have already seen in the LEGO Minifigures collection. They don’t, however, get the same bendable mini-legs from that series and so there-in lies the first disappointment as we’re stuck with two figures with little to no movement. 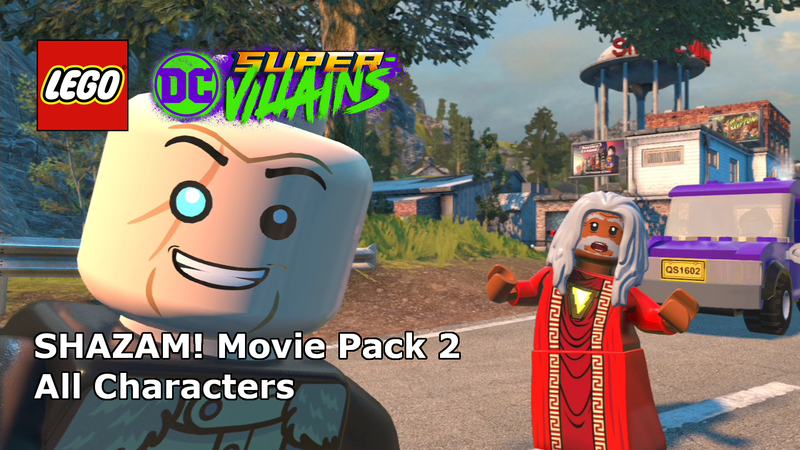 Starting with the titular character himself, the boy who lived, there are no surprises with Harry’s minifigure. For anyone that has seen the Chamber of Secrets movie, that is, as with the rest of the sets available, the design is based on the on-screen version of the stories. Despite the disappointment already noted regarding the rather boring legs, the torso design does a lot with very little – at the end of the day Harry is wearing a blue hooded top with a checkered top and grey t-shirt under that, there’s not much to recreate in all honesty. That said, the printing matches the movie perfectly, the hoodie only partly zipped allowing the short and t-shirt to show through. When we take a look from the back it’s unsurprisingly dull, it’s the hood to the blue hoodie, exciting stuff. 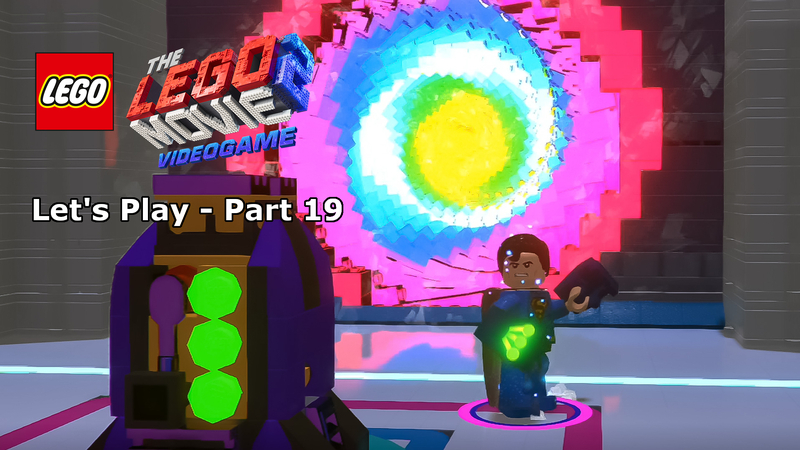 Head-wise and despite a few minor alterations from the LEGO Dimensions version of the character is exactly what fans would expect. The mouth is a slightly different angle and the eyebrows are a little thicker but other than that the glasses and lightning scar are exactly as before. On the other side of the head, there is a second face with a scared Harry on it. 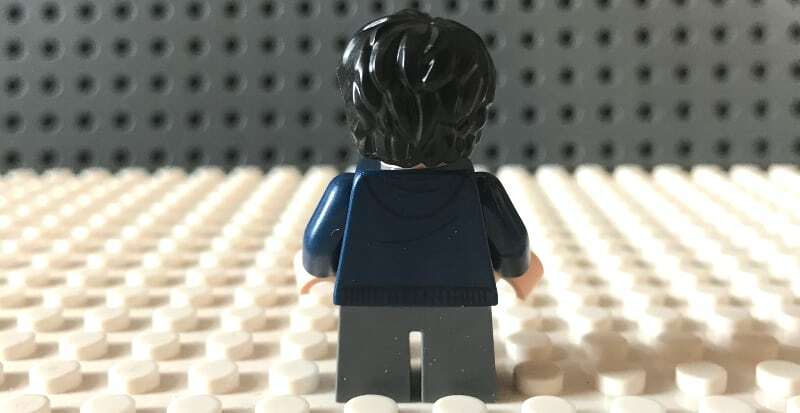 The hairpiece is very different from Harry’s last outing in LEGO, with more of a parting than a quiff, this is definitely the first time I’ve seen this piece – though I without extensive research I can’t say 100% if it is a brand new mould. In addition to the new wand, Harry also has a candle accessory. Moving on to Ron and it’s a similar story, a brilliant recreation of the movie outfit, but nothing mind-blowing to write home about. The tartan-style printing looks perfect when compared to the on-screen source material and, as you’ll see in the image above, you can just make out one of the characters iconic jumper necklines. 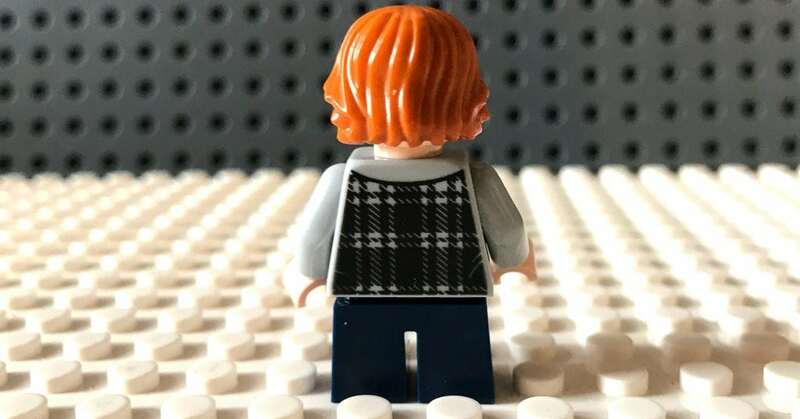 The back of the minifigure continues the printing from the front, it is the same tartan design that covers the jacket’s front. Other than this, however, there isn’t much else we can say about this. Face-wise and it is a simplistic design, though specifically designed to show a younger character. Larger eyes and a slight smirk are accompanied by the ginger eyebrows synonymous with the Weasley clan. Much like Harry, there is a second face showing an open-mouthed scared face. 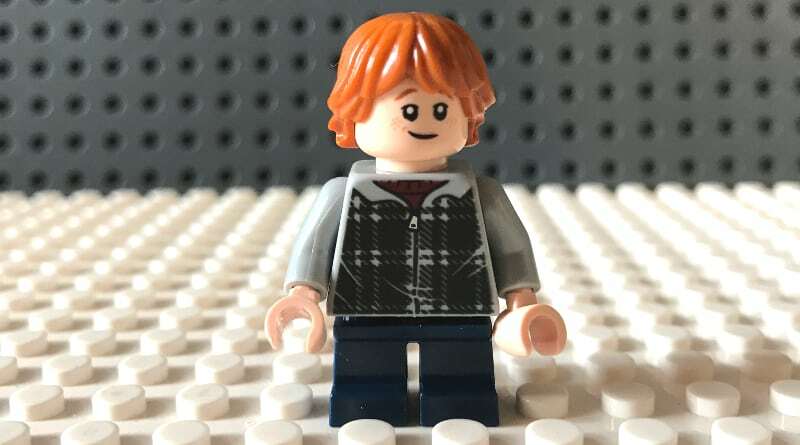 Similar to Harry again, the hairpiece looks slightly different from Ron’s last LEGO outing, with a similar parting vs quiff, in the Weasley ginger, of course. Ron’s best assist is the large lantern that comes with the character. It’s a two-piece design which is surprisingly effective. Just look at those eyes, how can anyone be scared of this guy? 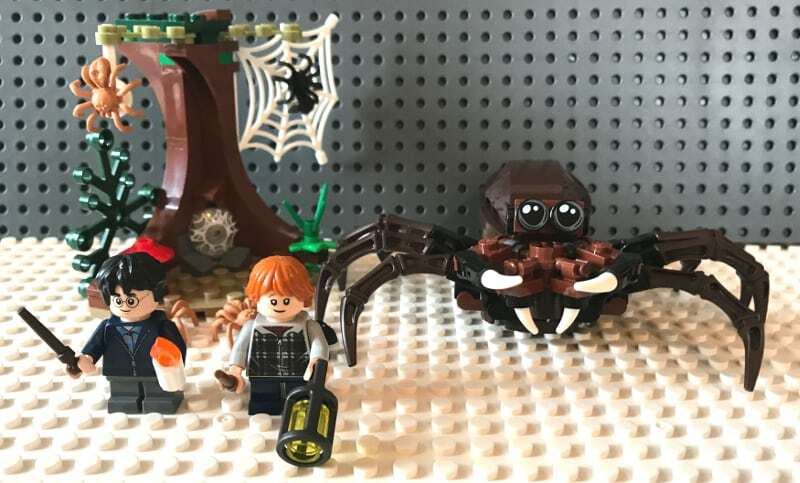 Aragog, the giant spider and former pet of Hagrid is definitely the star of the show in this set, it’s a glorious model which sets the theme for the set as a whole. In terms of build and the best comparison from a recent set I can make would be the build of Anthony, the large ant, in 2015’s Ant-Man movie tie-in set. The same legs and almost the same build of the back end make it an apt model to judge against. Looking closely at the front of the model and there are lots of movement options available. The eyes, all four of them, are clipped on to one hinge piece which allows them to move at a ninety-degree angle. This isn’t the only part of the face that can move, however. All four of the teeth have some movement, though it is the top two pinchers which can be moved the most, moving in and out – depending on how creepy you want to try and make the arachnid. The legs are brilliantly agile with all eight of them attached to a clip piece which, once attached to the main body can be moved up and down. The legs can also be rotated thanks to this brilliant design. Plenty of play and display options here. The backside of the model is one huge block of bricks, almost identical to what you’ll find on the aforementioned Anthony. It connects to the main body using a technics style stiff hinge so that there is some flexibility in how you pose the character. 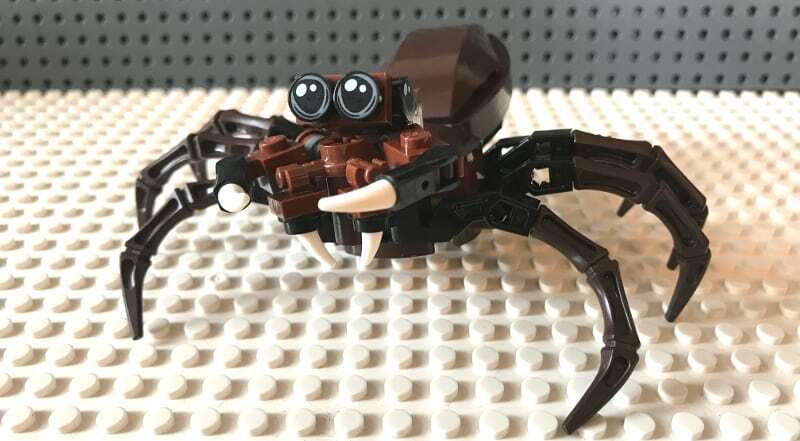 For the price, the minifigures and Aragog more than cover the value of the set (if not in piece numbers then certainly in collector value), but that is even more in the box. Helping to set the scene for the set, the scenery build is a wonderfully designed spider-infested tree. 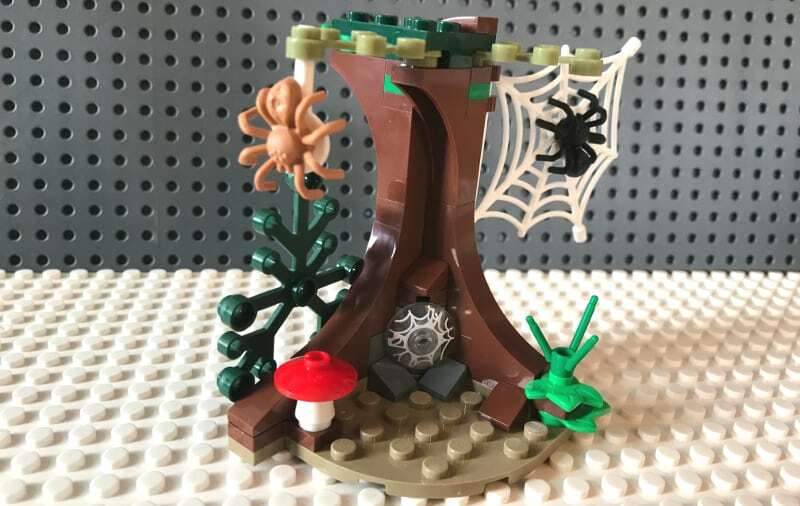 I’ve always been a fan of the superbly unique tree designs that LEGO designers come up with and this is a great example. Sitting on a small circular light brown the main trunk is surprisingly fun to construct with the bottom splitting off in a ninety-degree angle using large arched brown pieces for the base. 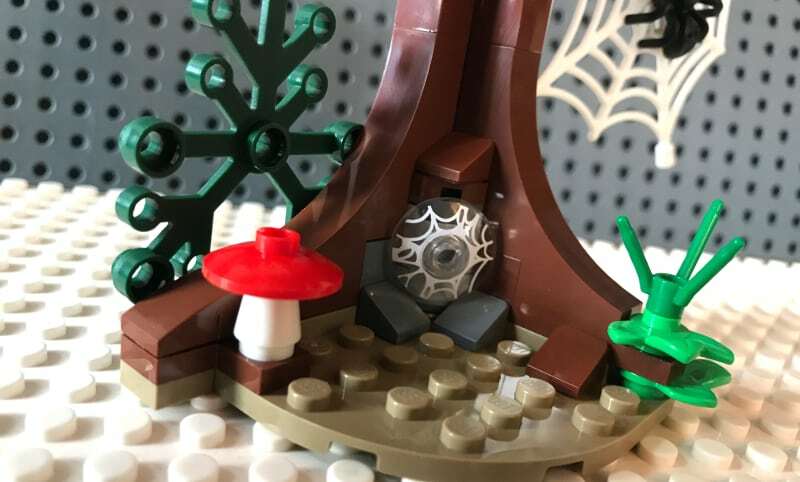 The top of the tree is a fairly standard build, but at the center of the base, you’ll find a missile-type launcher which shoots out a spider-web printed circular piece with a flick from the back. The scene build also comes with a large spiders web (and spider), similar to those on many Spider-Man sets of the past. This is connected to the tree via two brown clips on the back out of sight. A smaller web has been created using a white piece which is usually used for construction worker-style hand signs. Turned upside and pinned into the branch it makes an excellent web to clip another spider into. Additional detail on here includes a large dark green foliage piece clipped on to the back that can be rotated as required, a wonderfully simple toadstool and an interesting plant piece that fits in like a pin into a hole rather than the standard over the stud connection. Overall, as the smallest Harry Potter themed set of the new collection expectations might be low, but trust me, they shouldn’t be. For £12.99 you’re getting a wonderfully rich set which also includes both Harry and Ron. The Aragog model is a brilliantly fun build, as is the scenery. 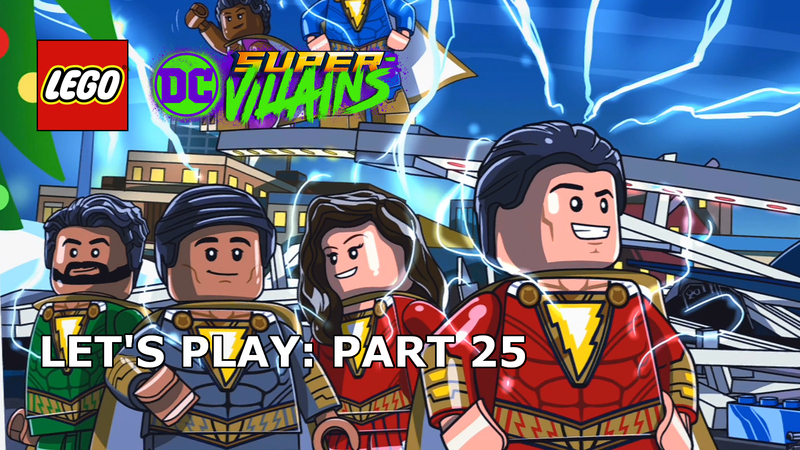 For such a low budget set, there is really very little that I can say in a negative light about this set, apart from the lack of bendable mini-legs, that is. No bendable mini-legs, a must now that LEGO has seen fit to include them elsewhere. This low-budget set has a lot going for it beyond the price. 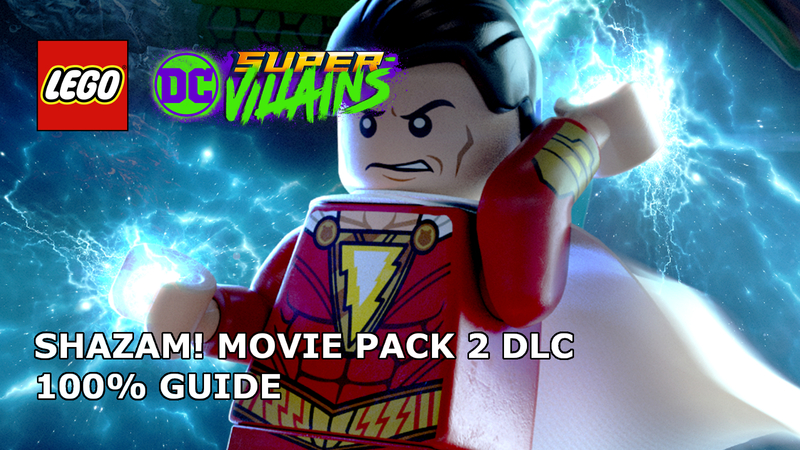 With Harry and Ron minifigure variant exclusives you’re already on to a winner, even their accessories add to the value of this set. 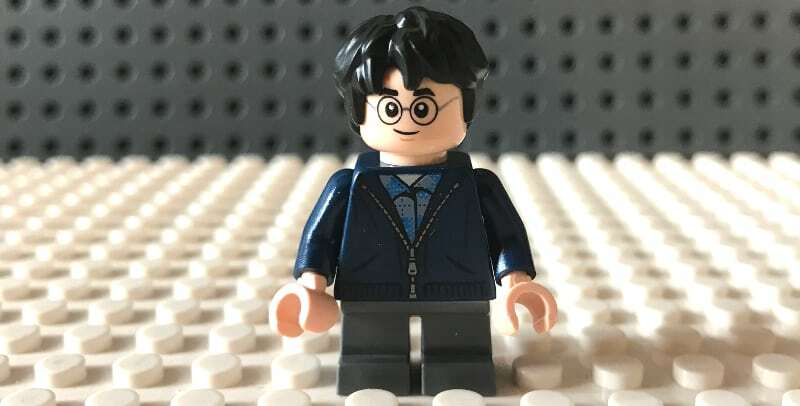 A bit of a let down that the designers didn’t include the new short bendable legs found on the new Harry Potter minifigures collection, but at least we get the new wand design. 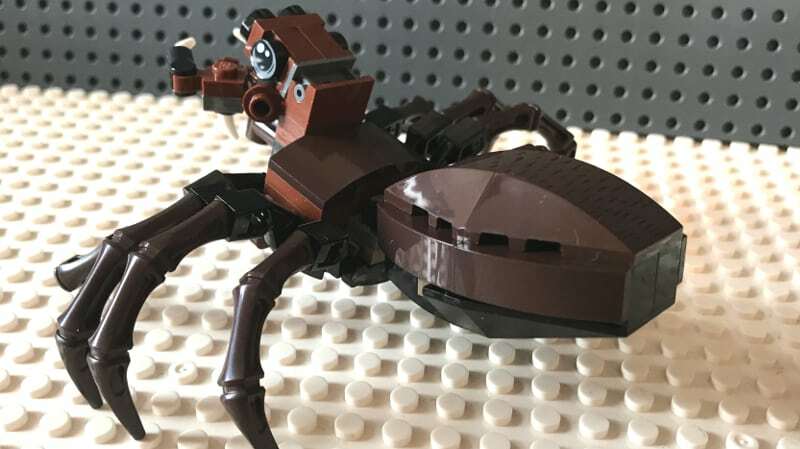 Aragog looks exceptional, a fun build and one that will no doubt terrify any arachnophobes out there. Added to all of this, the small tree scene build is a wonderful addition with a lot of detail thrown into a design of such few pieces. Definitely, one to recommend.